First, let’s take that step back. Imagine: your organization has journeyed a long, winding case development road, riddled by tracked changes, emergency visits to thesaurus.com, and end-of-day epiphanies. With the help of your leaders and volunteers, you’ve articulated a clear and compelling vision, honed in on those strong outcomes, and found a blend of urgency and optimism that feels just right. While you may have visions of gracefully sliding glossy brochures across your donors’ coffee tables, can you identify that perfect, high-impact image for the cover? Or perhaps working in PowerPoint makes you itchy with boredom and frustration (we’ve all been there—at Campbell & Company, our dreams are haunted by ghost textboxes and rogue animations), but are your project details ready to go to press? 1. Who will the main users be? Effective case materials are conversation starters and facilitators—not closers. While equipping your fundraisers and ambassadors with strong talking points, details, and images is important, these frontline folks are ultimately the ones doing the legwork: finding ways to connect donors with your vision and identifying investment opportunities that are exciting and fulfilling. Accordingly, taking the strengths and preferences of these “main users” into account is your first step toward meant-to-be materials. 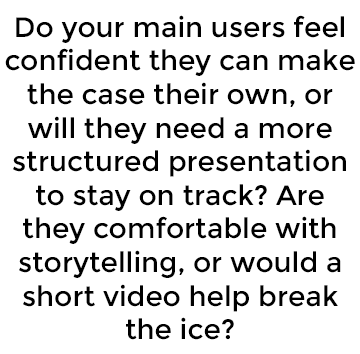 Do your main users feel confident they can make the case their own, or will they need a more structured presentation to stay on track? Are they comfortable with storytelling, or would a short video help break the ice? 2. Who is your desired audience? When your staff and volunteers feel confident and equipped, they can take your case a long way with sheer personal passion and conviction. But like any conversation, you can’t just focus on the delivery. What about the needs and expectations of your audience? Chances are that you know your donors pretty well. Who needs to have print materials in hand before engaging in conversation? Who will only be wowed by an iPad presentation? If your audience is broader, what do your email click-through metrics look like these days? Have you completed a donor or member survey recently about contact preferences? The more information you are able to draw on—whether it’s personal and anecdotal or hard data—the better chance you have of getting your case in front of the right people. 3. What conversations and events do you have on the horizon? Think ahead to the coming months (or even years): will your Board members be hosting any cultivation dinners? Will you be making any kind of campaign announcement at your annual gala? Does your CEO have any key speaking opportunities coming up? Developing communications that are flexible enough to fit a variety of needs—like a pitch deck that also provides your CEO talking points for that gala—will help prevent scrambles to create specialized materials for events. 4. What kinds of stories do you have to tell? We promise: storytelling isn’t just a nonprofit buzzword today, it’s a tried and true (and scientifically proven) way to engage your prospects’ hearts and minds. But…only if you have the right story. Start by taking an inventory of the stories and profiles you have at your disposal, and then consider how closely they tie into your current fundraising effort. If you have a powerful, person-centered story that clearly demonstrates your work’s impact, consider more dynamic formats like video. If your stories are shorter or more anecdotal, they might work better as sidebars to accompany narrative messaging. 5. Do you have strong photo or video assets? Visions come to life when we can imagine what their end-state looks like; whether it’s a bright-eyed, healthy toddler or a lush expanse of protected forest. But in order to show, not tell, you need strong photography, video, and other visual assets. Some organizations have great photo resources that they can immediately pull from, but many—including social service and health care providers that have client and patient privacy considerations—do not. If you fall into the latter group, be sure to factor in the time and money it takes to identify and purchase strong stock photography—or commission actual photo-shoots—as you consider highly visual materials like brochures. 6. What’s your budget—and what level of production is right for you? We know, you get it all the time: “You do such amazing work already—why do you need more money?” While this might be one of the more frustrating misperceptions you regularly encounter, it points to a common theme we hear across the sector: nonprofits are expected to miraculously produce results with exceptionally modest resources—especially when it comes to fundraising. This double standard can make case materials a tricky balancing act: your fundraising effort needs to stand out and feel special, but not break the bank (or look like you’ve broken the bank). There’s really no one-size-fits-all answer for this question, but rest assured that there is a path that will make sense for your organization and your budget. 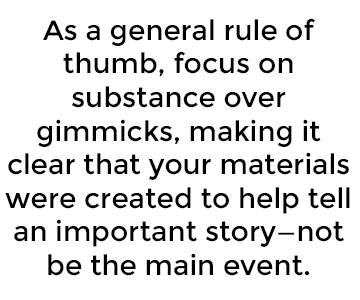 As a general rule of thumb, focus on substance over gimmicks, making it clear that your materials were created to help tell an important story—not be the main event. Even the most modest tri-fold brochure can stand out with clear messages and a strong ask. There are certainly times when a show-stopping piece is warranted: for example, if you have a huge capital project and visually inclined donors, maybe that animated fly-through video is for you. 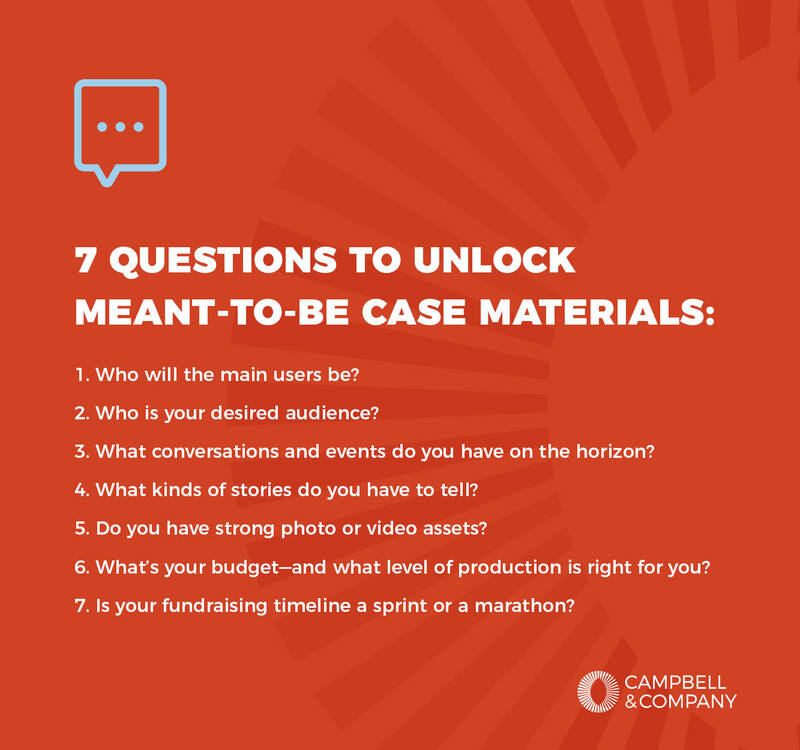 Ultimately—looking back to question two— it’s all about what will work for your donors and prospects, so be sure to talk to your out-the-door fundraisers and Board members about their expectations and preferences. 7. Is your fundraising timeline a sprint or a marathon? Last but not least, let’s talk shelf life. At Campbell & Company we know that no two fundraising efforts are the same; every organization has a different timeline, different internal and external pressures, and different stakeholder communities. We also know that quality case materials require a significant investment of time and resources. Accordingly, to ensure that your materials are effective, exciting, and relevant for as long as possible, consider the full breadth of the fundraising journey ahead of you. If those pesky project details or outcomes are coming along slowly, start in a flexible (read: editable) digital format like PowerPoint, Keynote, or Prezi. If your timeline is condensed, consider immediately moving to print materials so your fundraisers and ambassadors are fully equipped. Additionally, for those in campaign mode: even if your main focus is major giving today, make sure you spend some planning time looking ahead to the public phase. Will you be able to use the same brochure for broader distribution? Could your project details change significantly as your fundraising thermometer rises? By taking the time to think through these seven questions, your path to meant-to-be materials will become clear. And when those stunning brochures roll off the presses—or when the first frame of your video gives everyone in the room goosebumps...it will be so worth it. Feel free to contact me to discuss case materials or chat about other fundraising communications challenges.